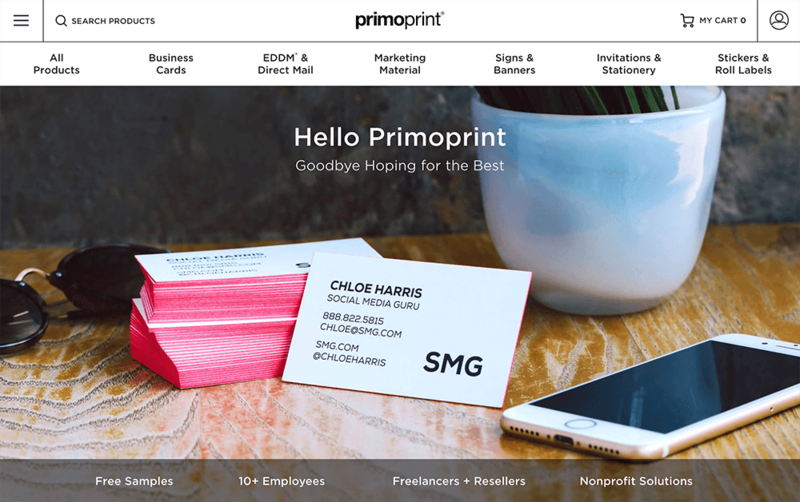 The Primoprint Shopping Experience – What’s Changed? At Primoprint we strive to improve the print shopping experience for our clients continuously. We’ve recently incorporated some new design changes to do just that. You can log in to your Primoprint account manually or via your Facebook, Google, or Twitter account. Once logged in, click on the account icon in the upper right-hand corner to access your account dashboard, current orders, and order history. Tip: If you are logged in to your account a light green dot will appear on the account icon. Navigate to the product you are looking for quickly and easily from our new primary navigation. This feature will save you time by allowing you to choose the product you would like to purchase right from our homepage. Tip: The “All Business Cards” heading in the top left of the drop-down will take you to our business cards page. To get you to the pages of our site that matter most to you, we’ve added secondary navigation to our homepage and various other pages throughout our website. Request samples, view our business services or join our reseller or non-profit printing programs right from the new secondary navigation toolbar. A new crowd favorite feature is our sandwich navigation drop-down tool. The easy to use tool allows you to access our support articles quickly, request a sample pack, download file setup templates, request a custom quote, view our gallery and blog. We’ve created a new page to give you the ability to shop all of our products from one place. This page was designed with the intention to make the overall Primoprint experience better. Tip: If you scroll down the page you will find you can request a custom quote and shop our large format print products from this page as well. You know the very bottom section of every website that you rarely pay attention to? No more! We have updated our footer to serve as a useful tool. Access our support articles, request design services, and check out our latest blog posts right from our footer. For us, this is just the tip of the iceberg. Your shopping experience is going to continue to improve as we continue to implement intuitive, user-friendly features. Stay tuned for more, and as always let us know if you have any questions about the changes we’ve made.